Dog Consumed By Alien Tabloid!! The pet store I frequent has lowered its standards by stocking checkout stands with tabloids, much like those found in supermarkets. I am understandably appalled. I thought dogs and their companions were many levels above this tripe, but I am apparently as wrong as the stories in these rags. The publications are selling like proverbial hotcakes (not to be confused with Flapjacks). Story: County animal control officers responded to a report of a Labrador Retriever being hidden in a ‘no dogs allowed’ condo. They found the lab being hidden under a blanket. The dog was producing an inordinate amount of stress-producing hormones. Headline: Dog Sues “I Heard It Through The Grapevine” Songwriter for $50 Million. 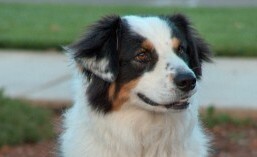 Story: An Australian Shepherd in Napa, CA, who has been herding sheep through the vineyards for 12 years, claims that he was the inspiration for the song and deserves a cut. Headline: Golden Retriever Has 100% Cancer Detection Success! Story: The dog wags its tail (a sign!!) at every patient he visits…at the chemo treatment room at a local hospital. Story: OK, this one is true. But I still think he meant to dial 411 for the number of the nearest delivery pizza. You get the idea. Now, I like being entertained as much as the next Aussie, but I don’t like spending my hard-earned dog biscuits being duped by unscrupulous pseudo-journalistic manipulators preying on those at checkout counters who are short on time and long on gullibility. I know…1st Amendment, freedom of the press, buyer beware, carpe diem, keep hydrated, and all that crap. Well, I don’t buy it. Literally. The point is, it’s getting more difficult to ascertain news from entertainment…take this blog for instance… Um, yeah..it’s all good.